Chris and Laura Moriarity had always enjoyed walking along the beach near their Anacortes home, but they were troubled by the amount of plastic that washed ashore. Inspired by YouTube videos about 3D-printed prosthetic limbs and what he already knew about the Great Pacific Garbage Patch, Chris Moriarity, who is pursuing an online MBA from the University of Illinois, had an idea: using a 3D printer to produce upper-limb prosthetics from ocean plastic. 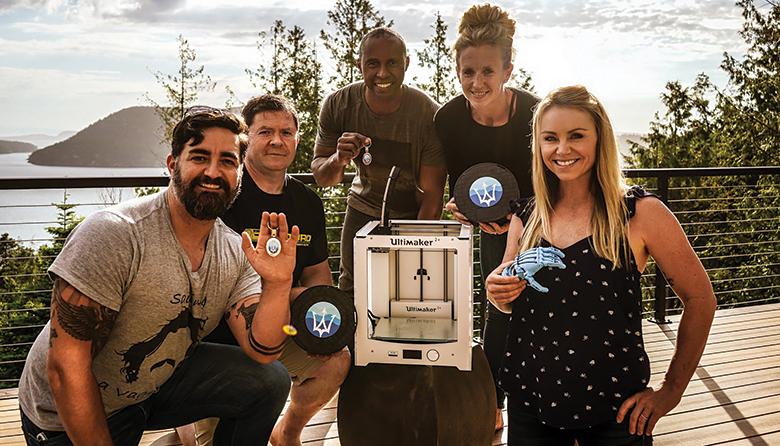 On Earth Day this year, in partnership with Washington CoastSavers, a nonprofit coastal cleanup organization, the Moriaritys launched the Million Waves Project, a home-based nonprofit that creates custom limbs from reclaimed ocean plastic using a 3D printer. “It takes about 30 plastic water bottles to create one hand,” Chris Moriarity says of the process. Million Waves finds its clients online through a “limb request” page. Recipients never pay a dime; the $45 cost of the limbs is funded through donations. Many requests come from developing countries, but Moriarty explains that professionally made prosthetics can be prohibitively expensive even for people seeking them in the United States. Million Waves has created more than 50 prosthetics and concentrates on upper limbs because the plastic isn’t strong enough to support the weight load placed on a leg or a foot. The process involves shredding reclaimed ocean plastic into granules and turning the granules into rolls of filament that are fed into a 3D printer. A version of this story appeared in the November issue of SEATTLE magazine.